The reforms introduced by Rowland Hill in the Victorian reformer period changed the face of the British postal service for ever. He opened up what had been a complex and expensive system to a much wider public. This coincided with an increase in literacy and together with this, resulted in greatly increased communication. Before 1840, the British postal system was highly complex and very expensive. 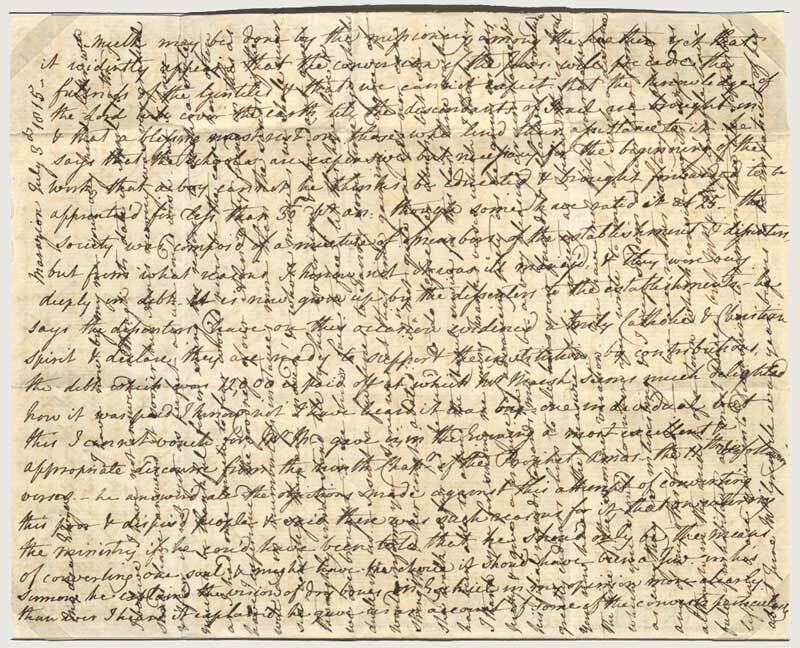 Letters were charged by distance and the number of sheets of paper they contained. Normally, the charge was paid by the recipient. As a result people often ‘cross-wrote’ their letters to save money. However, a large number of items travelled free, especially a certain number of letters to and from Members of both Houses of Parliament, and things such as newspapers. There were also a lot of anomalies and a number of local systems with different charges. The system was widely abused and ripe for reform. After the Napoleonic Wars postage rates were high. They were designed as a tax to raise revenue. A typical single letter from Dublin to London would cost 1s 3d – a lot of money in those days. Two sheets of paper doubled the cost, three tripled it. However, there were a lot of local services – Penny Posts – which charged an extra 1d for delivery, although only 1d in total was charged for mail within the extent of the local post. In the case of some cities this area was quite large, Glasgow, Manchester and Dublin being particular examples. The London area was originally a Penny Post but by this time the charge had risen to 2d, or 3d for outlying country areas. In Scotland there was an additional charge of ½d for all letters carried by mail coaches, and similar tolls were levied for certain bridges such as the Menai Bridge. All Members of Parliament, Commons and Lords, had the right to frank and receive a number of letters free. This also applied to others by virtue of their position. As a result, correspondents frequently asked their MP to frank their post so that it travelled free. Various ideas were proposed to improve the system and various official inquiries took place. Nothing happened, despite the best efforts of Robert Wallace, a persistent parliamentary critic. Then in January 1837 Rowland Hill published his pamphlet Post Office Reform: Its Importance and Practicability. He had no doubt that the source of trouble lay in the complexity of the charges and the mixture of paid and unpaid letters. His solution was prepayment. The charge should be low and uniform and he recommended that it be 1d up to one ounce in weight. No mention was made initially of the method of prepayment. Later that month he suggested the use of stamped covers, an idea put forward before by Charles Knight. An official inquiry into aspects of the Post Office was still continuing and Hill was summoned to give evidence. He outlined his plan and expanded his idea of stamped covers. Then, referring to possible difficulties with people unable to write, he suggested the use of “a bit of paper just large enough to bear the stamp, and covered at the back with a glutinous wash.” This suggestion was made in a letter to the Chancellor of the Exchequer, a draft of which is now in the Phillips Collection. This was eventually to become the Penny Black, the world’s first adhesive postage stamp. When the inquiry reported later in 1837 the commissioners recommended Hill’s plan to reduce postal charges. They appended examples of stamped covers printed on John Dickinson’s silk-thread security paper. After a campaign by Robert Wallace a parliamentary Select Committee was appointed with him as chairman to look into postal charges with a view to reducing them without loss of revenue. At the same time, in early 1838, a private Mercantile Committee on Postage was set up, consisting of merchants agitating for lower postal rates. Hill was a member of the Committee and Henry Cole was made its Secretary. Cole threw himself into organising petitions and arranged for a newspaper, The Post Circular, to be published as a propaganda sheet for postal reform. In the fourth issue of the newspaper a letter from James Chalmers of Dundee was reprinted. Chalmers had written to Wallace in December 1837, and later to the Post Office, suggesting for ‘slips’ to prepay postage. He also supplied examples which he had designed and printed, and which he cancelled with a datestamp to prevent re-use. Wallace published the final report of the parliamentary Select Committee in March 1839 recommending most of Hill’s ideas but with a uniform 2d rate. This resulted in a lot of activity and some action was demanded of the Government. Public pressure meant that Lord Melbourne, the Liberal prime minister, promised a bill in favour of uniform penny postage. This was passed and given the Royal Assent on 15 August. It enabled the reduction of postage rates to a uniform penny regardless of distance but measured by weight. Free franking would be abolished and prepayment would be in the form of stamped paper, stamped envelopes and labels, though this would not be compulsory. Rowland Hill was appointed to the Treasury to oversee the implementation of his ideas, with Henry Cole as his assistant. At the same time a competition was announced, later called the Treasury Competition, to invite the public to suggest the best plan for ‘covers’. Some 2,600 entries were submitted, most of which have not survived. Several included samples of ideas for prepayment. Some of these were names already well-known such as James Chalmers. Charles Whiting, the printer of material for the Mercantile Committee, also produced a number of designs printed by the Congreve bi-colour method. The competition was judged by Hill and Cole awarding prizes to Francis Coffin and James Bogardus, Benjamin Cheverton, Charles Whiting and Henry Cole himself. In his report Hill decided that postage should be prepaid by means of stamped covers, stamped envelopes, adhesive stamps and stamps struck on paper submitted by the public. These needed to be designed with security uppermost in mind. The covers and envelopes were created by William Mulready with an imperial design which was widely caricatured when it was issued and had to be withdrawn. Adhesive stamps were based on an engraved head of Queen Victoria as this was the most difficult image to forge successfully. All items, with the exception of the stamped paper submitted by the public, became valid for postage on 6 May 1840. The most important and successful were the labels, the Penny Black and the Twopence Blue, the world’s first adhesive postage stamps. Uniform postage charged by weight was first introduced on 5 December 1839 when it was reduced to 4d anywhere outside London. It was immediately successful, so much so that uniform penny postage was introduced on 10 January 1840. 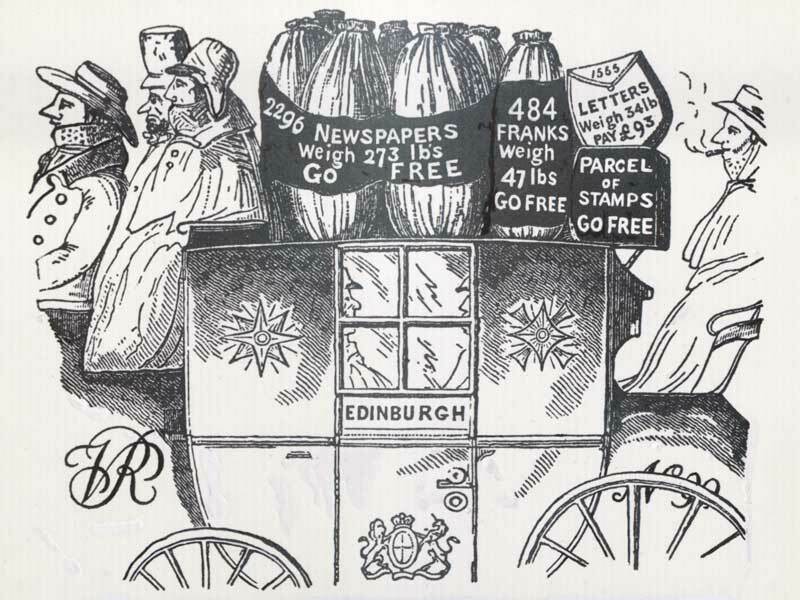 At the same time free franking was abolished, including that of Queen Victoria as an example to others. Postal reform was an immediate success. The number of chargeable letters in 1839 had been only about 76 million. By 1850 this had increased to almost 350 million and continued to grow dramatically. Revenue was initially cut but with the increase of letters it soon recovered. Adhesive postage stamps were gradually introduced throughout the world. With the change to charging by weight envelopes became normal for the first time.